LIGO uses interferometry to detect gravitational waves as they pass through the Earth. Where do gravitational waves strong enough to be detected on Earth come from? Few objects in the Universe are massive enough, but two black holes spiralling towards each other and eventually merging could give just such a strong and characteristic signal. At 16:29 CET, this is exactly what LIGO announced had been observed, followed by extended applause. Scientists at CERN are excited about this discovery. Not only because it has been a much sought after treasure – with searches starting over 50 years ago with Joseph Weber – but also because it could have a direct link to some of the searches we are performing with the ATLAS detector at the LHC. Gravitational waves are described by the general theory of relativity as proposed by Einstein, and encompass massive objects (both stationary or moving very fast) at very large (cosmological) distance scales. At CERN we are interested in a coherent and testable theory for gravity at the very small scale, so-called quantum gravity. The LHC is used to accelerate protons up to velocities very close to the speed of light, colliding them together at enormous energies within detectors placed around its 27 km circumference. 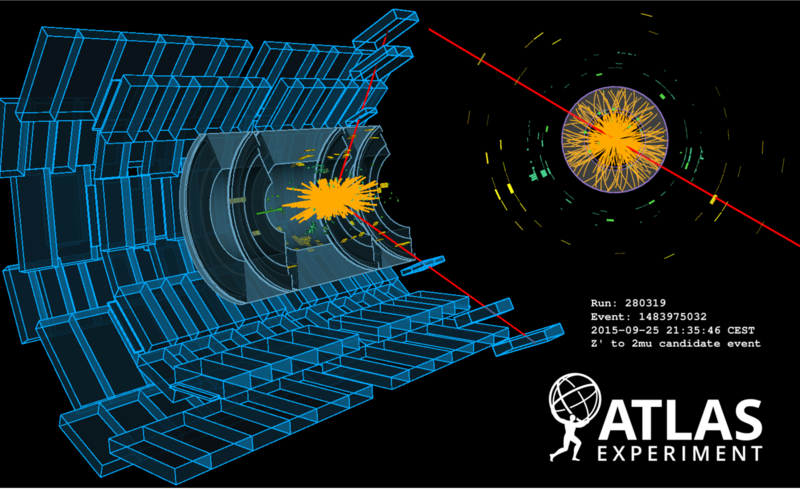 Detectors such as ATLAS and CMS act as giant digital cameras and try to work out what happened during that interaction. It is in the data collected by these experiments that some theories suggest a theoretical particle called the graviton could be found. The gravitational waves mentioned in the announcement yesterday, should actually be related to a massless version of the graviton. The experiments at the LHC are not sensitive to this kind of graviton or the gravity waves detected by LIGO. However, in quantum theories of gravity massive states of the graviton could also exist, being created within the ATLAS detector and subsequently decaying into pairs of particles such as electrons, muons or photons. All of these signatures of a graviton and more have been searched for using the ATLAS detector (, , ), and the observation of such a particle with the statistical precision that is required to claim a discovery in our field (5 sigma), would be a direct observation of quantum gravity. It is interesting to note that it is at a statistical significance of 5.1 sigma that LIGO claimed its discovery yesterday. But gravity is a peculiar force, unlike any other we know. For one it is extremely weak – so weak that it loses in a tug of war over a metal nail, with the gravitational pull of the entire earth on one side and a small hand-held magnet (using the electromagnetic force) on the other. It is when you realise how weak gravity is that you begin to comprehend how titanic the spiraling and merging of those two black holes must have been to allow them to be detected on Earth, over a billion light years away. Scientists at CERN are excited about this discovery. Not only because it has been a much sought after treasure – with searches starting over 50 years ago with Joseph Weber – but also because it could have a direct link to some of the searches we are performing with the ATLAS detector at the LHC. It is also for this reason that most of the theories of quantum gravity involve extra spatial dimensions. It is suggested that within these extra dimensions, gravity has a similar strength to the other forces of nature, and it is just in our three known spatial dimensions that we feel its diluted strength. In the popular extra dimensional theories, the size of these other dimensions could either be small, with a warped geometry, or very large (micrometres!!! ), with a flat geometry [60 second guide to extra dimensions]. It is precisely because we explore such high energy scales (and thus small distance scales!) with the ATLAS detector, that we could probe these extra dimensions (if they exist) and potentially observe a massive graviton. However, other theories suggest that gravity might not be like a normal force at all, that it is simply due to space-time geometry. This would be unlike the other forces of nature that we know of, which have particles that communicate the strength of the force during interactions (in the theory of quantum gravity, this would be the graviton). So the announcement yesterday of gravitational waves being discovered is exciting, because it could help point us in the right direction when looking for a massive version of the graviton (if extra spatial dimensions exist) here at the ATLAS experiment. Do these waves exhibit a behaviour that could shed light on quantum gravity? Perhaps using wave-particle duality – a phenomenon that already describes the duplicitous nature of light as both particles (photons) and waves (electromagnetic spectrum)? Conversely, could the details of this discovery put a dent in all of our current theories of quantum gravity and require theorists to go back to the drawing board? With the startup of the LHC again in March, collecting up to 10 times more data this year than we did last year, I might be sitting in that room again not too long from now, with a discovery announcement of our own. Daniel Hayden is a postdoctoral researcher for Michigan State University, using the ATLAS Detector to search for Exotic new particles such as the Z' or Graviton, decaying to two electron or muons. Born in the UK, he currently lives in Geneva, Switzerland, after obtaining his PhD in Particle Physics from Royal Holloway, University of London. In his spare time Dan loves going to the cinema, hanging out with friends, and talking... a lot.